A team of four student engineers from CSU has won the national Engineers Without Borders (EWB) Challenge for their design of a composting system for food waste. 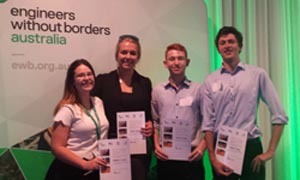 A team of four student engineers from Charles Sturt University (CSU) has won the national Engineers Without Borders (EWB) Challenge for their design of a composting system for food waste. The EWB Challenge Showcase was held on Tuesday 13 December in Melbourne and 2016's top performing teams of first-year engineering students from Victoria, Queensland, South Australia, Western Australia, New South Wales and New Zealand represented their universities and presented their designs for judging. CSU's team – Mr Adrian Hickey, Mr Lachlan Hicks, Ms Amber Thomas and Ms Rebecca Willcox – and their project 'Creating a Composting Solution' beat out teams from RMIT, University of Sydney, University of Queensland, University of Western Australia and more to win the prestigious national prize for 2016. CSU engineering student Mr Adrian Hickey said, "Our task for the challenge was to find an engineering solution that would improve the quality of life for the residents of the Mayukwayukwa Refugee Settlement in Zambia. "What we did was develop a composting solution that takes food scraps, which are currently a waste problem for the community, and turns them into a valuable resource for the community." Another member of team CSU Ms Amber Thomas said the strength of their solution lay in it being able to be built locally and from locally available resources such as drums which themselves are a waste product within the camp. "It was very important that the solution we created could be implemented and maintained locally," Ms Thomas said. "Our winning design is one that can be manufactured simply with the skills and tools that are already available at the camp." The team's national success is a highlight for the new CSU Engineering degree program, which only commenced this year. CSU Foundation Professor of Engineering Euan Lindsay said, "We are delighted with the success of our team. "Our goal is to train entrepreneurial engineers who can change the world; this success at the EWB Challenge shows that our program is already delivering on that promise." EWB Australia's Engineering Education Officer Ms Alison Stoakley explained that the EWB Challenge is a humanitarian design program focused on sustainable community development in a real-world context embedded in the curriculum of over 8,000 first year university students at 30 universities throughout Australia and New Zealand. She said, "Through the EWB Challenge, our community partner organisations are presented with crowd sourced ideas to address community-identified projects. In 2016 the EWB Challenge partnered with UNHCR Zambia and the community of the Mayukwayukwa Refugee Settlement in the Western Province of Zambia and the student design ideas will be passed along to UNHCR Zambia to support their work." The CSU student engineers in the winning EWB Challenge team are Mr Adrian Hickey from Berrigan, Mr Lachlan Hicks from Bathurst, Ms Amber Thomas from Tamworth and Ms Rebecca Willcox from Wodonga. All study engineering at CSU in Bathurst. Applications to study engineering at CSU in 2017 are still open www.csu.edu.au/engineering. For more information contact CSU Media on 0417 125 795.